Road Trail Run: Garmin inReach Mini Review - Finally!! 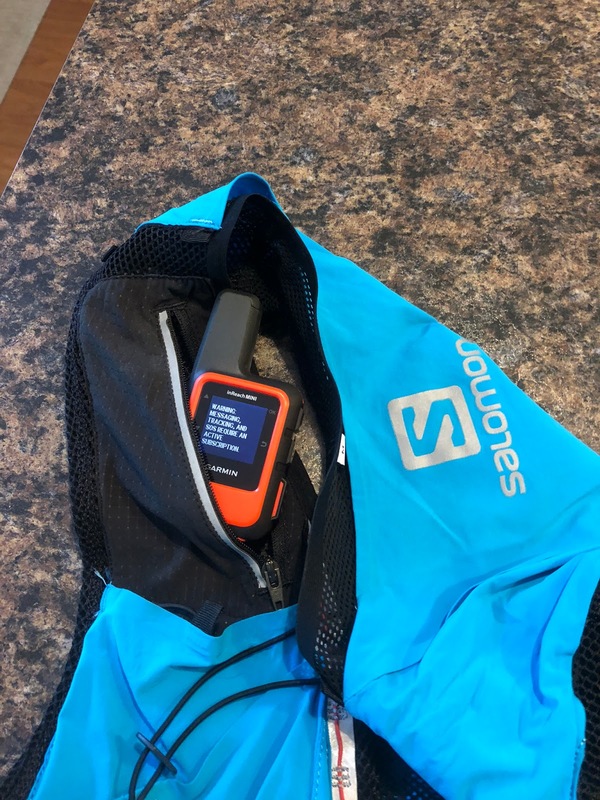 A Lightweight Two-Way Satellite Communicator For Runners, Travelers Off the Beaten Path and Gram Counters! Garmin inReach Mini Review - Finally!! 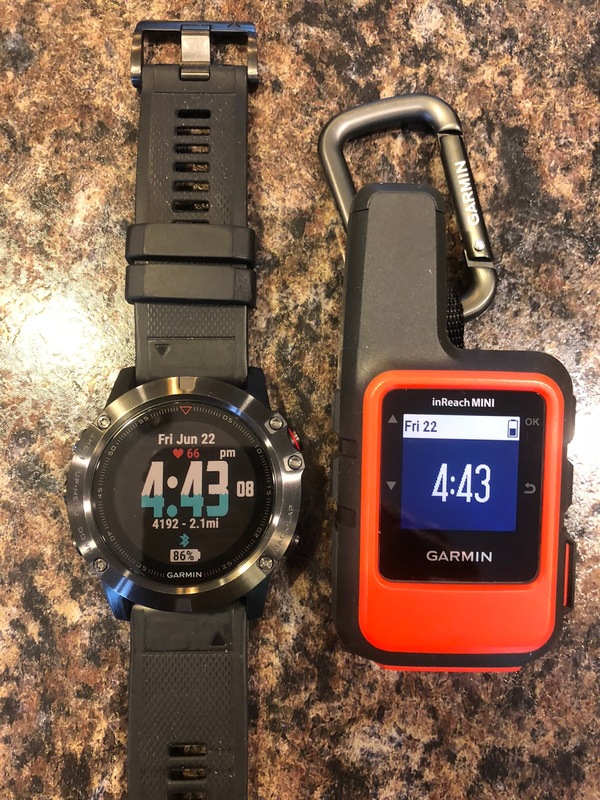 A Lightweight Two-Way Satellite Communicator For Runners, Travelers Off the Beaten Path and Gram Counters! 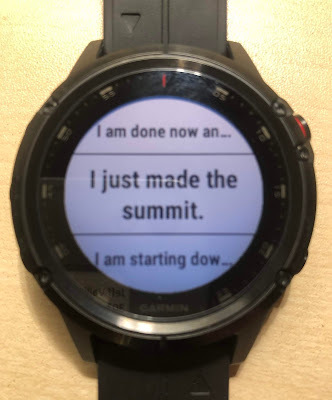 For years I have considered some sort of satellite emergency tracking device for my adventures in the mountains, especially hearing story after story of somebody being saved because of one, but also more so when I hear of somebody not making it because they did not have one. On top of that, I have some close friends who have had near death, loss of limb injuries in the backcountry, friends who are more skilled than I. As careful as I am, I am well aware that even a small mistake when running/hiking/adventuring in the mountains can have dire consequences. 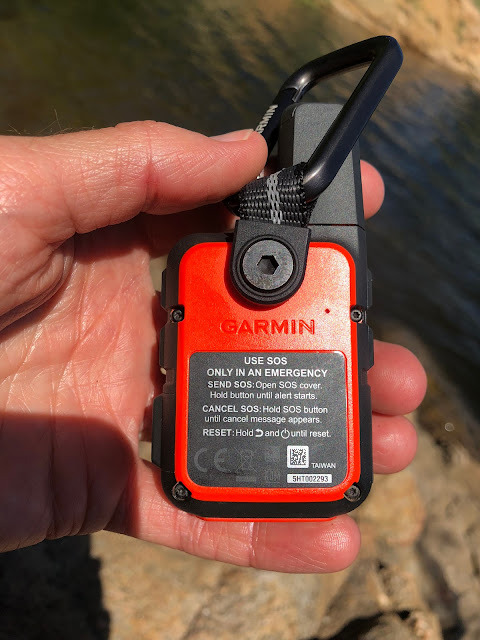 As I also start taking my 7 year old daughters on more mountain adventures outside of cell phone range, the decision to get an emergency tracking device was increasingly weighing on me. 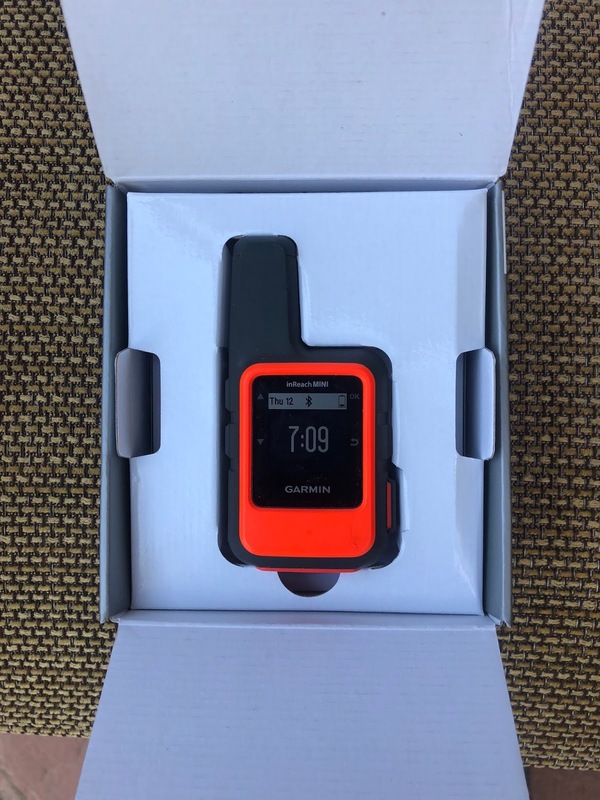 The offerings from Garmin (after they bought out DeLorme, maker of the inReach) were most appealing as they offered the ability for 2 way communication (important to confirm SOS message has been received and to communicate details to rescuers), the freedom of very flexible use plans depending on your specific needs and the option to start/stop and pay by the month if one so chooses. But, the normal inReach is a touch on the heavy side (7.5 oz.) 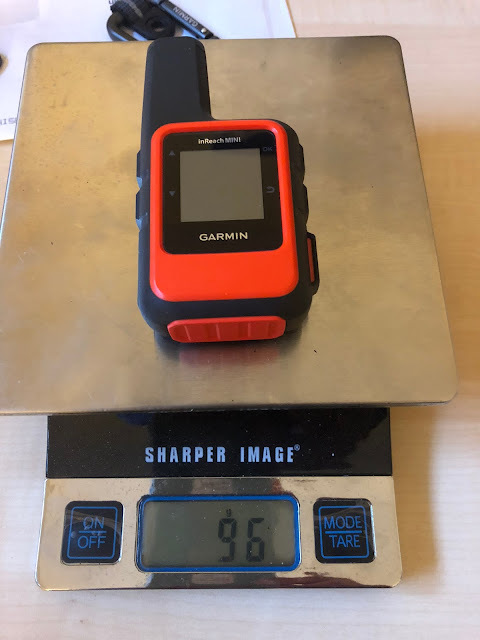 and large (more than twice the size of the Mini) and expensive ($399.99 and up), with features that I don't need such as GPS maps and navigation all of which I get from my iPhone and GPS watch. Other devices like Spot are a reasonable size/weight, but still not super tidy, the plans not very flexible and the SOS communication is one way, meaning in an emergency, you press a button and hope that the message sent and keep your fingers crossed that help will arrive. The Mini, as the name implies, is remarkably small and light, just a little bit larger than my Garmin Fenix 5X and weighs about the same. The inReach comes in both safety orange and black. The black version is below, although I much prefer the orange, as the Mini is small it would be easy to lose (at least in a gear bag or if dropped on the ground). For runners like myself who try to go as light as possible, the Mini, for all of the added safety it provides, is absolutely inconsequential in terms of weight or size to bring along and fits in any running hydration vest or running shorts pocket. Most of these pockets are made of materials that are thin enough to not interfere with satellite reception. With the key biner attached, the inReach Mini weighs just 113 grams. With key biner and hardware removed, I managed to shave off 17 grams of weight to get to 96 grams. 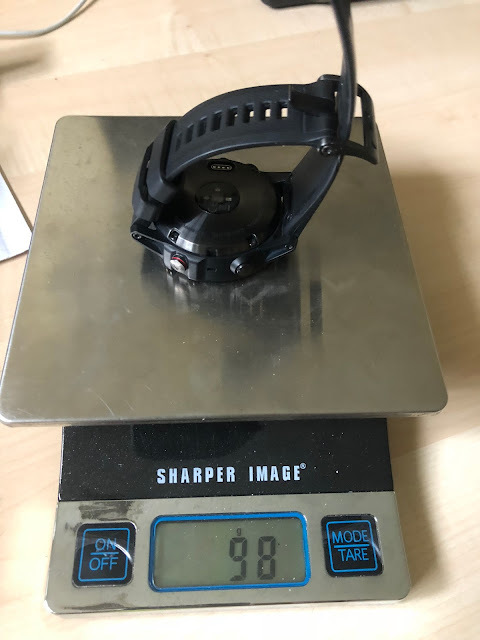 By comparison, my Fenix 5X weighs 98 grams (though it is admittedly a large and heavy GPS watch). 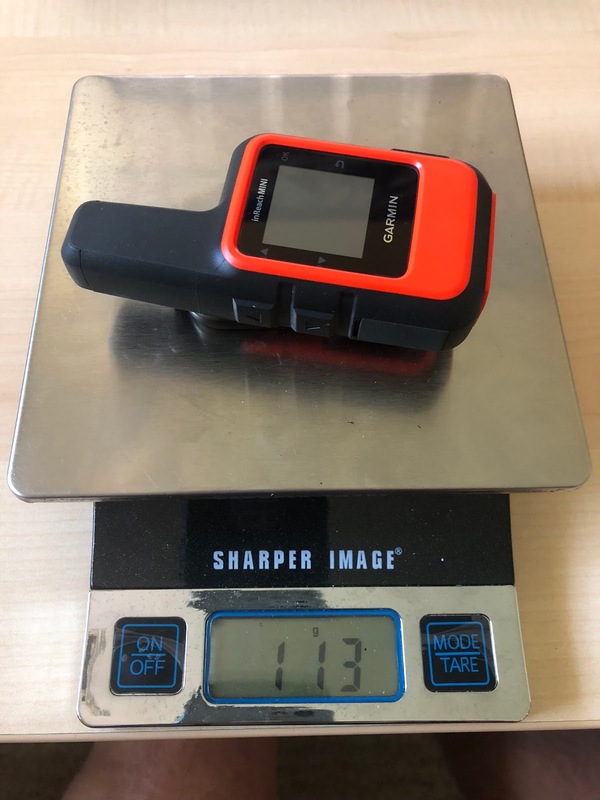 And for further comparison, my iPhone 8 with Lifeproof FRE case is 191 grams. I'll most often bring along all 3, but sometimes for faster outings where I want to go more minimal, I'll leave the phone behind, as I can easily communicate in case of emergency (or even if I were just overdue), through the Mini. 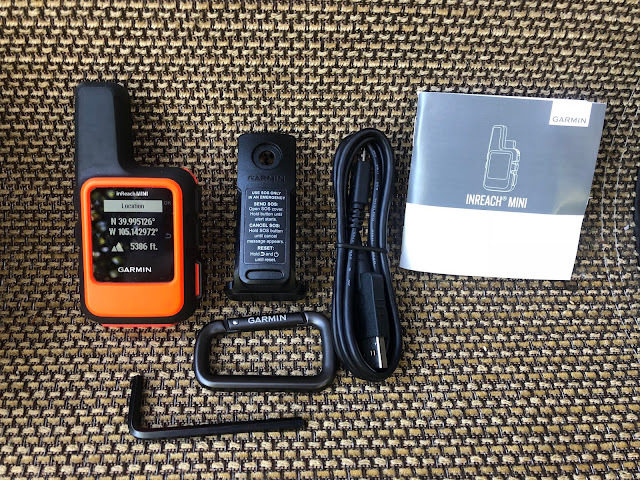 In the box you get the inReach Mini of course, a USB charging cable, a key biner, a bracket for attaching to a variety of mounts (sold separately), an allen wrench (for installing the bracket to the unit) and the users guide. The bracket installs easily and can be used with or without the biner clip. All of the extra bracket hardware adds some weight, so I just leave the bracket in the box and only use the key biner if clipping to a pack and then, if need be, remove the biner to shave weight/bulk when running. The internal (non swapable) battery is easy to charge with a USB charging cable. Battery life is approximately 50 hours at 10 minute intervals and 20 days at 30 minute intervals. 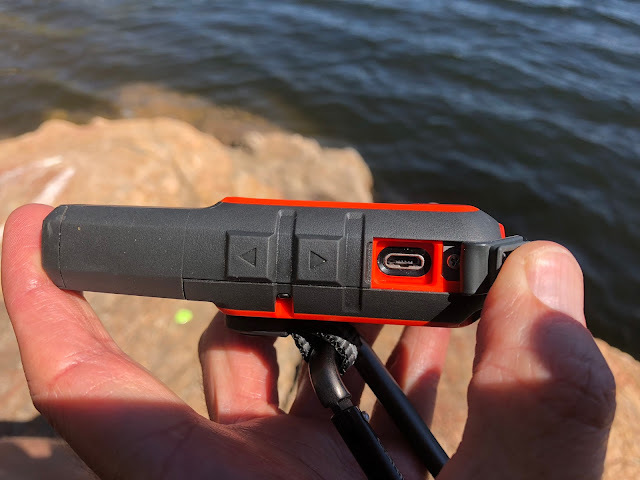 At 10 minute intervals I have found these predictions to be accurate and if in the field for longer, it would be easy enough to charge on the go with a solar panel or supplemental battery pack. The two way satellite messaging of the inReach via the Iridium Satellite Network is a huge advantage and easy to use. 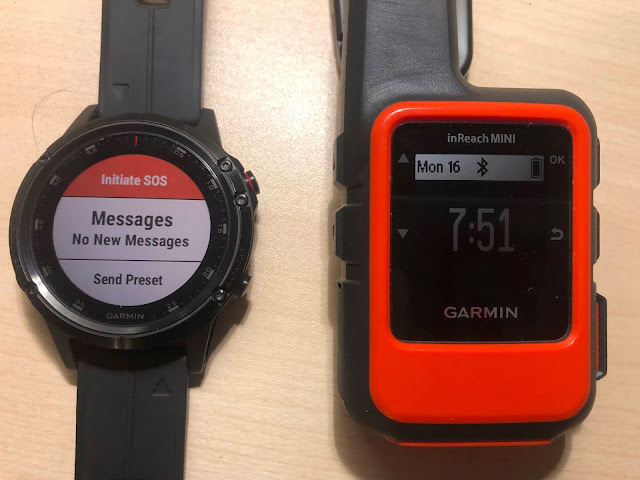 There are a variety of preset messages that you can use as is, or you can add/modify ahead of time under your Garmin inReach account (for a total of 23 different messages). 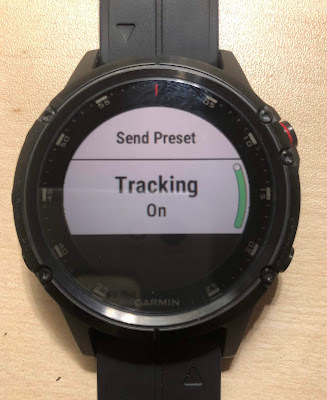 You can send these preset messages easily from the unit itself, or better yet, if you have a Fenix series GPS watch that connects to the inReach, you can send messages from the watch (more on that later). You can also type up a new message through the unit, but it is slow and laborious with a lot of pressing and scrolling. 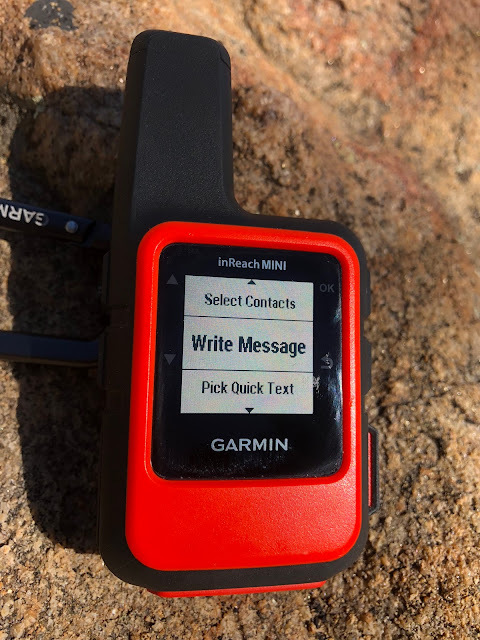 Much easier and convenient however is the ability type up messages on your phone through the inReach app with the phone connected to the Mini via Bluetooth. Sample messages from my account. Additionally you can share your location with your contacts and share your inReach page for real time tracking. In the screen below, you can scroll to select characters to send a custom message, which would be handy when communicating with rescuers and the preset messages might not be applicable. This method is slow and tedious even in casual circumstances, so would strongly suggest typing any messages through the phone app, which is as quick and easy as sending a normal text with Mini acting as the transmitter receiver. Messaging screen within the app. Having tested sending messages to myself out in the field, the speed at which these messages are sent varies. Some messages transmit almost instantly, while others can take up to 15 minutes, which I suspect has more to do with the receiving phone reception status and signal strength and acknowledgment back to the Mini that transmission is complete more than it does the transmission of the message off the unit, to the satellite and into the cellular system. And of course you have the SOS button for serious emergencies. Thankfully I have not had to test this button yet, but nearly got a chance on a recent hike where a lady was choking on her sandwich far out of cell range. I hung around until I knew she was OK, but was secretly itching to pull the SOS trigger just to get a front row seat as to how it all works (though was of course relieved she was OK). Simply flip the tight fitting SOS cover open. 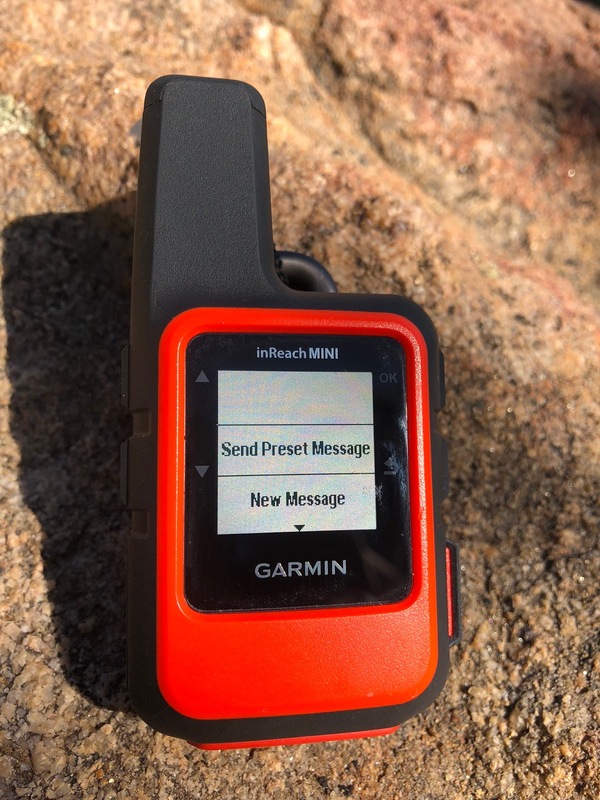 Press the SOS button (you have 20 seconds to change your mind and cancel) and a message will go out to a 24/7 inReach command center, where they will message back and forth with you via inReach messaging. They will gauge the severity and notify search and rescue, as well as your emergency contacts you have listed to your account. An accidental activation of the SOS button seems to be highly unlikely, as the cover is very secure. Alternatively, you can signal SOS from within the mobile app.. 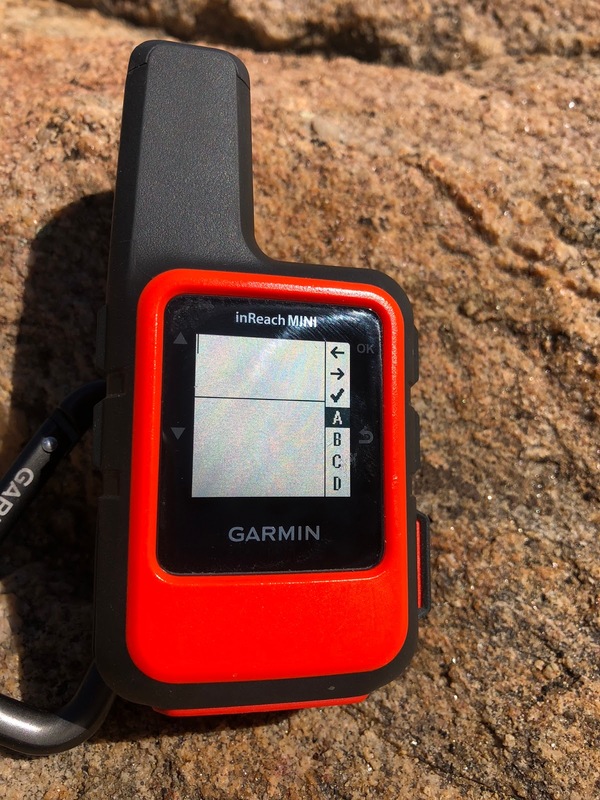 The inReach Mini when tracking is a great tool for others to follow along with your progress. You can send a message ahead of time, or during an outing to share your location or track for the day. This is a great feature, where a significant other, family member or friend can follow your progress for fun and to be sure that you are moving along as planned. 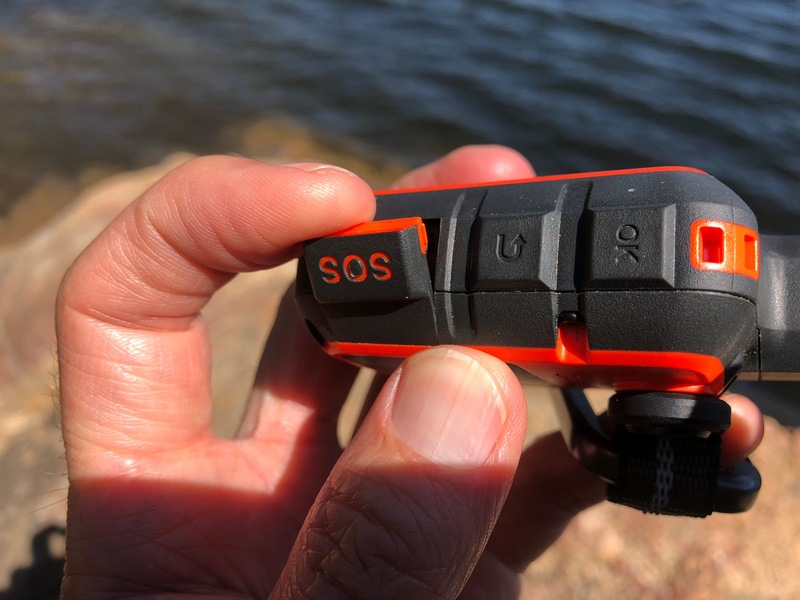 If for some reason you were hurt and unable to press the SOS button, this would be added insurance, as whomever was following would notice that you have not moved in some time or checked in, signaling something could be wrong and initiate rescue, providing you last known location. You can also pair the inReach with the Earthmate mapping within the inReach mobile app. for easily tracking your location in real time, as well as following routes or courses that you can sync up ahead of a trip. I have found the Mini GPS antenna paired to the Earthmate map to be very accurate. Zoomed out view showing some recent location points. Without cell coverage, you can get weather reports from satellites, basic ones as illustrated below are included in any plan, but if you want more detailed reports you get charged a dollar for them. If you also have a Garmin Fenix series watch or a Forerunner 935, you can connect with the inReach through the inReach widget. With simple button controls, you can view the stats recorded on the inReach, toggle tracking on/off, send messages, mark waypoints and activate SOS. 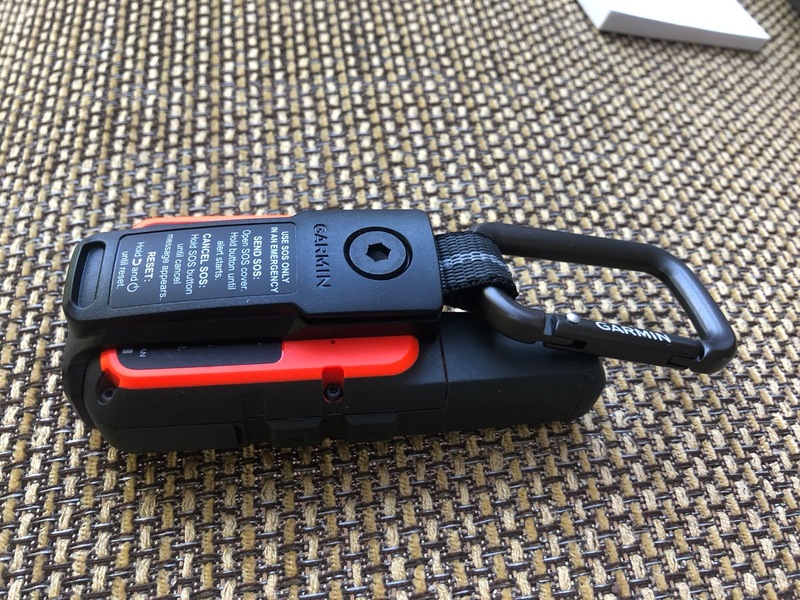 This is super handy, as I typically have the inReach stashed or clipped somewhere out of the way (reachable, but much easier to access a watch). 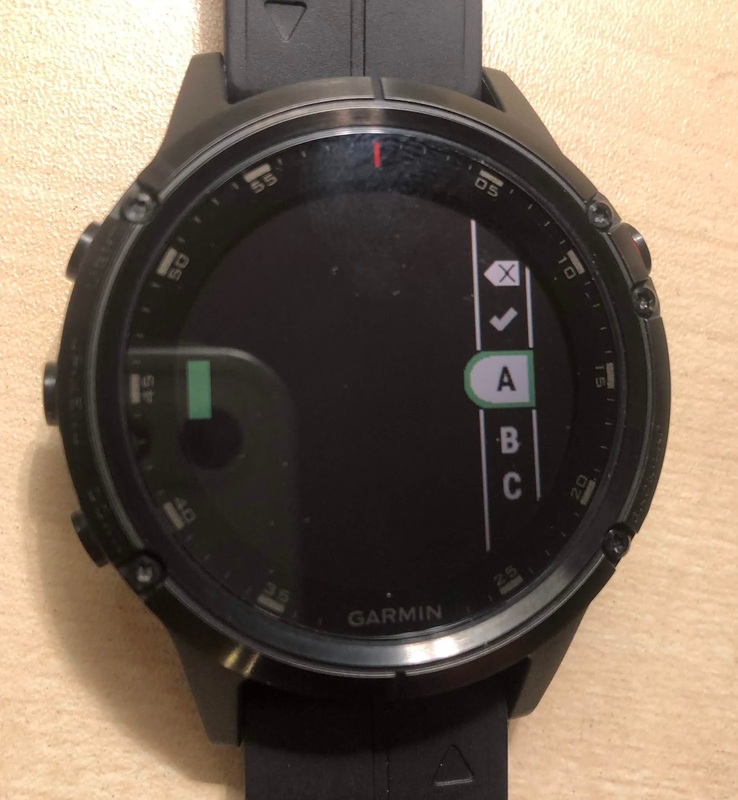 In fact, I find the menu on the watch to be easier to navigate and operate than using the actual unit. I prefer using the watch to toggle the tracking on/off, as it seems more intuitive. Just like you can on the Mini, you can peck and scroll to create a message, but it is slow and tedious. I couldn't imagine doing this under duress in an emergency situation, so best to carefully plan your preset messages, or use the phone app. to type. 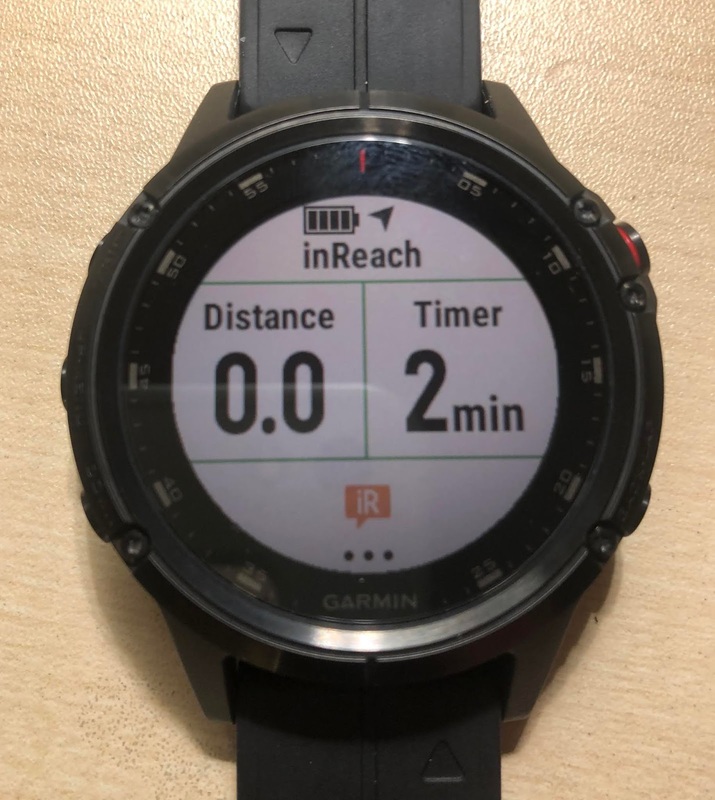 Connected to the inReach, you can see its take on distance and time. I find this screen to be redundant, since if wearing a Fenix, I am already tracking, but it is good just to confirm. One of the primary advantages of choosing inReach, aside from the two way capabilities are the flexible plans, starting as low as $11.95 per month. You can opt for year long subscriptions to save, or you can opt for a monthly Freedom plan where you pay only for the months where you are planning to need the inReach (though varying fees are applicable to activate or drop to a lesser plan). I can attest to the durability of the inReach Mini. 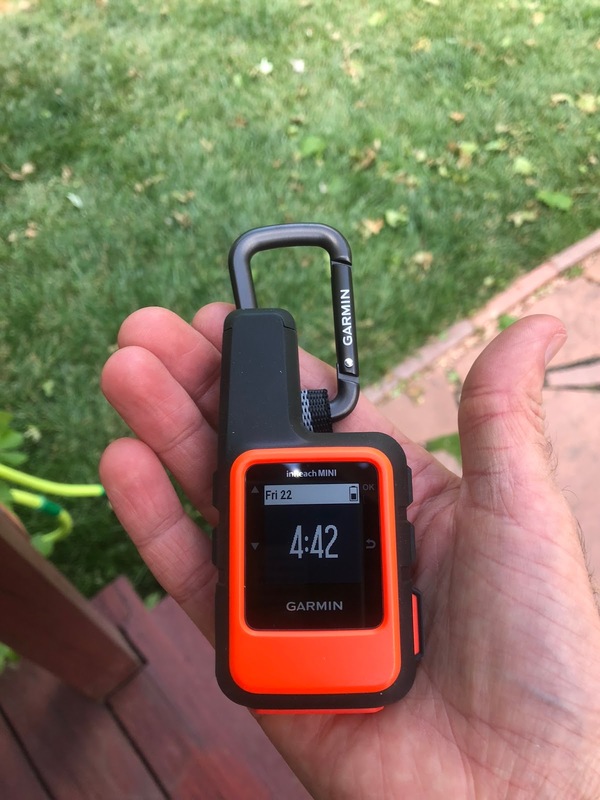 On on my first day using it, on the rocky summit of Bear Peak in Boulder, I somehow managed to fumble the Mini while trying to ease it back into my running shorts pocket. To my utter dismay, I watched it flip through the air and ricochet off of several rocks before landing about 6 feet below (nearly launching off the 50+ foot sheer drop to the West). I was certain it would be broken, with a cracked screen at the very least, however I was amazed to discover that aside from being a little dirty, there was not so much as a scuff or scratch. It is water rated to IPX7, which essentially means it will withstand splashing/rain/snow, etc..., and can be immersed in 1 meter of water for up to 30 minutes. 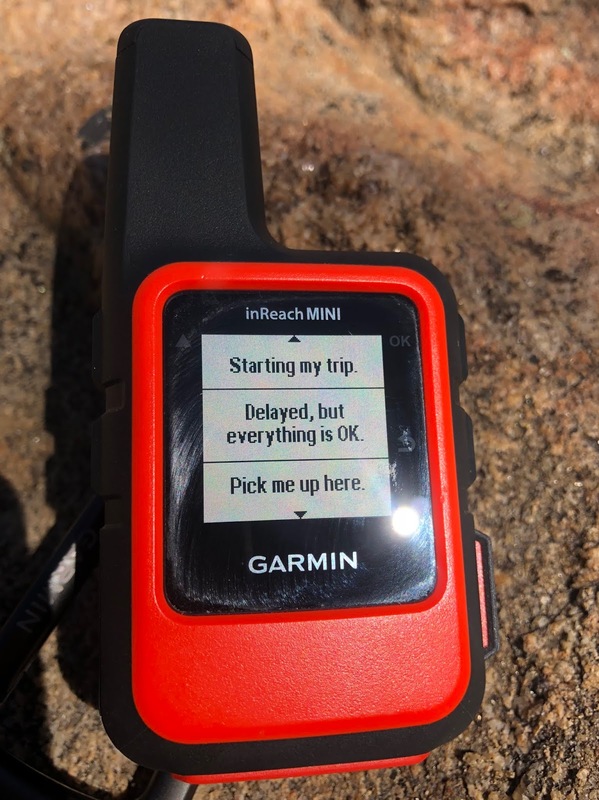 Garmin has really nailed it with the inReach Mini. Not only is the unit high quality, small, light and durable, but the whole package works flawlessly. From the integration with Fenix and 935 watches, the inReach/Earthmate app. with detailed topo maps, two way Iridium Satellite communication and flexible subscription plans, I highly recommend the inReach Mini for adventure and travel. I waffled for a long time between buying a SPOT or an even larger full size inReach. I likely would have gone with the inReach because of the two way communication and flexible plans, but was dragging my feet in hopes something smaller/better would hit the market and Voila! The timing on the release of the Mini was so perfect, I could hardly believe it. 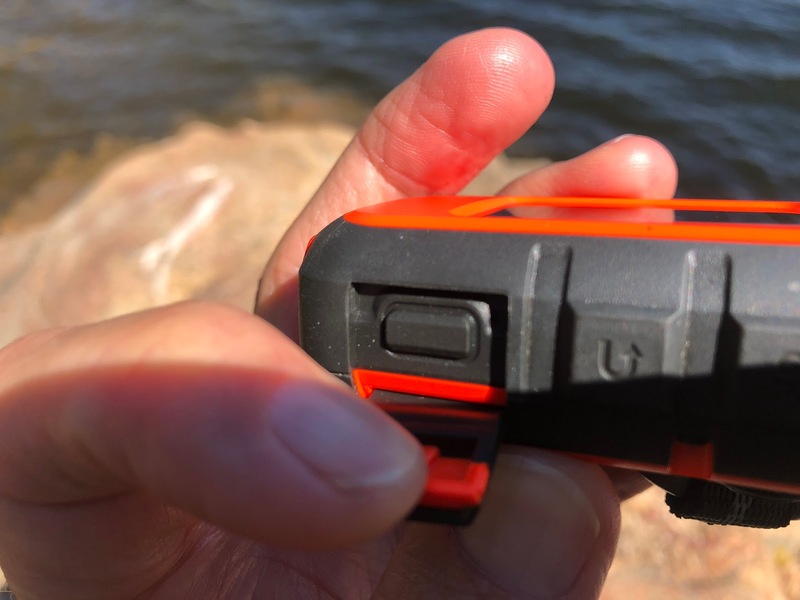 Since receiving the inReach Mini, I have taken it on every run and hike and I am never aware that I even have it along as it is so small. Spending time off trail, in remote areas out of cell range, adventuring with my 7 year old daughters, running at night, in the winter, I feel confident that if the worst happens, I'll have a better chance. 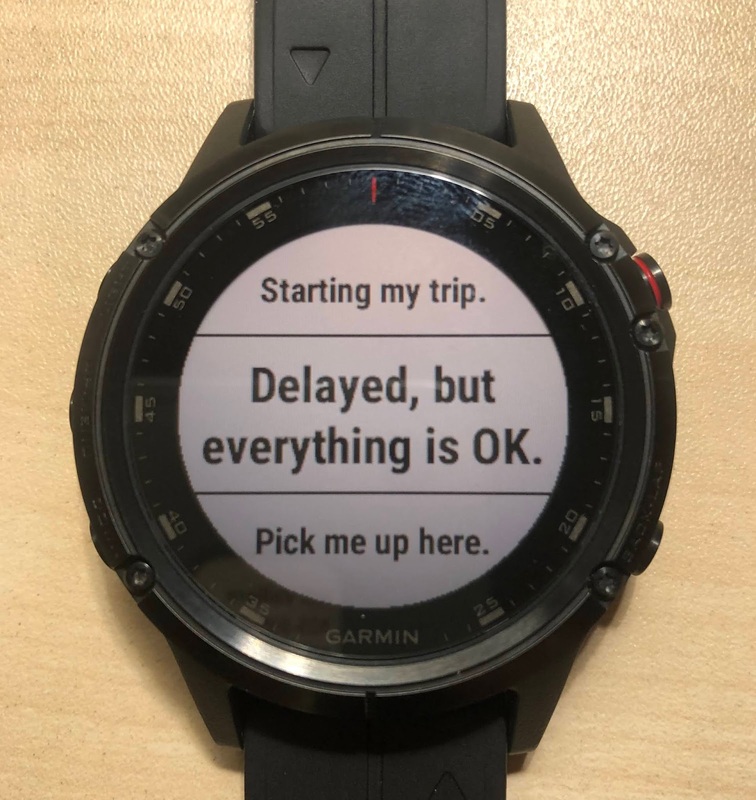 The Mini will also come in handy for casual and international travel, as a navigational tool when out of cell range, as well as a communication device if need be in those remote situations. Good stuff as always amigo. I've been looking for a hands-on real world review of the Mini and am delighted to find this one. It's well written and covered what I needed to make a purchase decision. I'll be fly fishing in the Montana wilderness in August and doing some back country hiking in New Zealand next February. The InReach Mini will be with me. Thanks for an excellent review! Great in-depth review and just what I needed to read as considering making a commitment to a personal locator for the Scottish Highlands as a 60 year old with a dodgy back. Thank you.